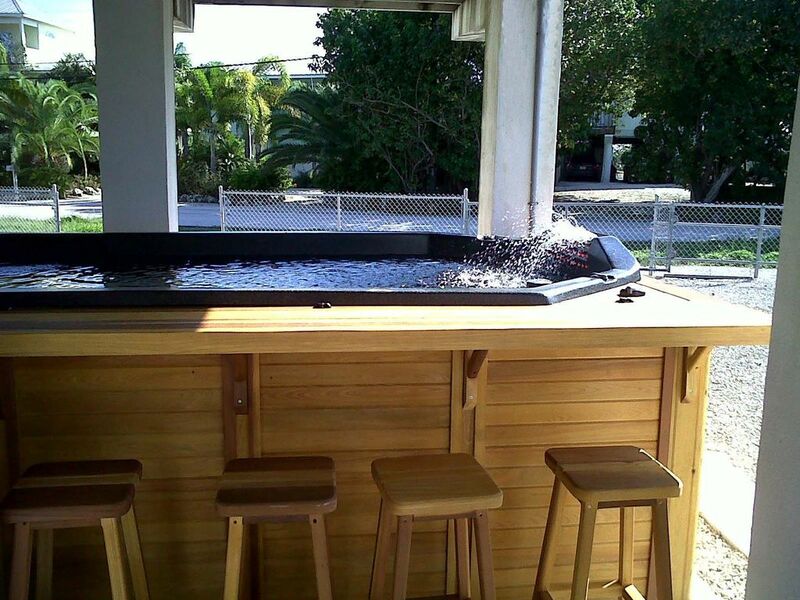 Heated 8' x 14' above ground Spa/Pool! Free 2 two-man Kayaks during your rental. Wonderful elevated home across the street from open water. Home sits on a huge 180' of sea walled canal with plenty of room for larger boats, and offers a secluded porch overlooking wooded lot on canal. This is a very CLEAN, three bedroom/two bath home. A turn-key property with all items available for your use from towels, to bedding, to pots and pans, just bring your bathing suit, toothbrush and clothes. Outside enclosed heated shower. All the comforts of home, including washer/dryer, microwave, new flat screen TV in Living room with HD cable and Wi-Fi, DVD, ice maker in frig, bait freezer in shed, gas grille on porch, garbage disposal and free long distance phone to the lower 48 states. This is a Non smoking home. We own both sides of canal, giving you total privacy along the water. The home is on the Atlantic side of Cudjoe Key, with no bridges to open water. Watch nightly sunsets from your porch and pool. The fully enclosed yard is kid and pet-friendly; Chain link fence with gate along canal for safety! Call or text us for last minute booking/rentals 772 216 2953. We may be open! Sorry, no motor homes or campers permitted. Canal Front home. We own both sides of the canal totaling 180" of seawall. You can tie larger boats on the other side of canal or along the end. Seawall wraps around the entire property with cleats. Free Long Distance to lower 48 states. in Patio closet on 2nd floor. Parking under the home or yard. 3 TVs, 2 Flat screens, 1 HDTV with DVD player. Comcast Cable. Inside the HDTV in Living room. Private Large Pool Spa under the home. New in December of 2018. Watch the setting sun from the heated spa pool at our beautiful Keys home. All the comforts of home in this vacation setting are waiting for you, with all amenities to make your stay as comfortable and worry free as possible in this clean, three bedroom/two bath home. The kayak is out back, waiting for you to paddle out the isolated canal across the street from Cudjoe Bay. You can dangle your feet while fishing off the 180' of seawall, with plenty of room for your larger boat. N Just look at all we offer: * 180' seawall along canal - we own both sides of the canal to offer total privacy. * Close to two full-service marinas with fuel, bait and boat ramp. * Two man kayaks available for your unlimited use. * Heated 8'x14' pool with spa jets. * Outside enclosed heated shower. * Fully enclosed yard, kid and pet friendly, with gate along the canal for safety. * Towels, bedding, cookware, washer/dryer. * 2 Beach Bikes for cruising. * New flat screen TV, cable, Wi-Fi, DVD, free long distance to lower 48 states. Excellent home for a Vacation! My family and I enjoyed staying at this property for our Keys vacation. The home was very clean. We enjoyed paddling the kayaks and using the Huge hot tub! The screened in porch was a perfect place to enjoy morning coffee and sunsets. The home is close to Key West and also local restaurants and markets. We have just returned from a six week stay at this house. We arrived in mid January, just four months after Irma slammed Cudjoe straight on so we did not know what to expect. When we got there we were pleased to find the house in a-one condition -- it had survived the storm fairly intact, and the owner had made all repairs to return it to excellent condition. The owner was very easy to talk to and work with. He wants his renters to be satisfied and have a good experience during their stay. The house is very comfortable, clean, and all appliances and amenities worked as advertised. The Spa/Pool is amazing and enormous. It would be lots of fun for a family (or a party), but two can enjoy it, as well. My husband and I are walkers and we liked this location because we could cross the highway and take long walks on the trail paralleling US #1. This trail would also be a good place to ride the bikes that come with the house -- something we did not do because we were always walking with our dog. The kayaks that come with the house are excellent. Finally, two things that I really liked about this house that made staying there a pleasure: 1) good, reliable WiFi, and 2) it was easy to clean! When you are away from home for an extended period of time, you appreciate "being connected," and it is so nice to not have to spend lots of time on "household chores" while on vacation. The house is well set up to be comfortable and connected and easy to care for. Thanks, David! We thoroughly enjoyed our stay in your home. The home was clean and comfortable and had everything we needed. The canal docking was great for our boat and loved being at the quiet end of the canal. Highly recommend this home to anyone and the SquareGrouper restaurant is a must for a fantastic meal! We loved this home!!!! We had an amazing stay! Very clean home, hope to see you next year. If you are looking for a place that is quiet and relaxing yet close enough to get to Key West easily, this is the place. The house itself is comfortable and well equipped. The screened in porch was used by everyone in the morning to relax and read the newspaper. The hot tub was used and enjoyed. Our favorite restaurant, the Square Grouper is within walking distance and we ate there several times. Key West is such a quick drive from the home, we were able to visit several times. Best of all was the proximity to the water. We did not use the canal as it was a quick drive to boat ramp. Again, we were in the perfect location to venture out into the ocean or to the gulf side. The water is incredibly beautiful and the fishing is great. We had a wonderful time and hope to return again next year. out to Looe Key. Looe Key, is known for great snorkeling and SCUBA diving. Fabulous restuarants, from casual to fancy. 5 mins. to Big Pine Key, home of the Key Deer. Small Deer, found only in the lower Keys.